History books are wonderful windows into the human past but beware, they can also be misleading. On the whole, historians do a remarkable job of piecing together what happened long ago but they too make mistakes and quite often these mistakes are deliberate. It has always been the powerful, the winners and the secure that have the luxury of telling people what happened. You can be sure that in most cases the story they tell makes them look good and fits with their ideological beliefs. British history recalls how in 1558 a small but determined English naval fleet beat off the powerful and evil Spanish Armarda. Spanish history books tell a different story. They tell how the evil British that had renounced the one true Christ and his servant the Pope survived only because of an accident of the weather. There are always two sides to a story. Another important point about historians is that they like things to fit. Who can blame them? The psychological Myers-Briggs profile of the average historian is that they are inward looking, analytical and somewhat insecure. When information is presented that disrupts the perfectly recorded story it’s a real problem. Let’s face it … you’ve just spent half your life recording and explaining what you understood to be true and then some smart guy comes along and says: “Hey , isn’t this amazing. Look at this circuit board I’ve just found in a lump of coal.” For historians this is the stuff of nightmares. How do they deal with these anomalies? For the closed minded it’s a three stage process: Ignore, deny, debunk. Still, for all their efforts the museums of the world are full of artifacts and records that don’t fit. Some are hoaxes, some are mistakes but some are remarkable and deserve better investigation. Here are ten popular examples of direct and indirect ancient technology that have upset the official story. This remarkable mechanical device that is often described as the World’s first analogue computer was retrieved by sponge divers off the coast of Antikythera in or around 1900AD. Scientists all agree that it is real and that it dates from some time during the 2nd century BC making it well over 2,000 years old. It comprises of a complex system of dials, gears and cogs of extraordinary precision. Experts agree that it represents a standard of production that would not be seen again until the rise of complex clocks and clockwork in the 18th century. After decades of research the current thinking is that it was used as an astronomy calculator to predict and measure the movement of the planets in relationship to the Sun, Earth and the Moon. For decades after its original discovery the importance of the find was overlooked until archaeologists and modern scientist began to appreciate the significance of such early mechanical sophistication. Since then it has been x-rayed many times using evermore advanced equipment. Working reconstructions have been made and entire research groups established to unlock the secrets of its manufacture and its purpose. 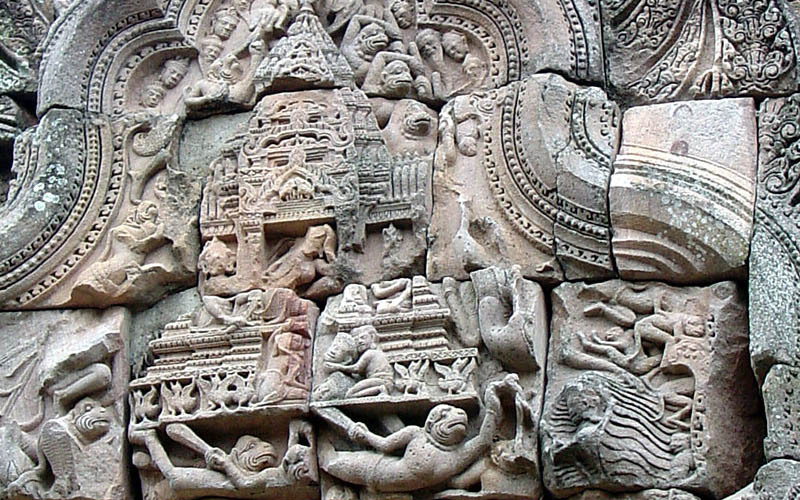 Its existence has challenged many preconceived ideas regarding the technological abilities of the ancient civilisations. 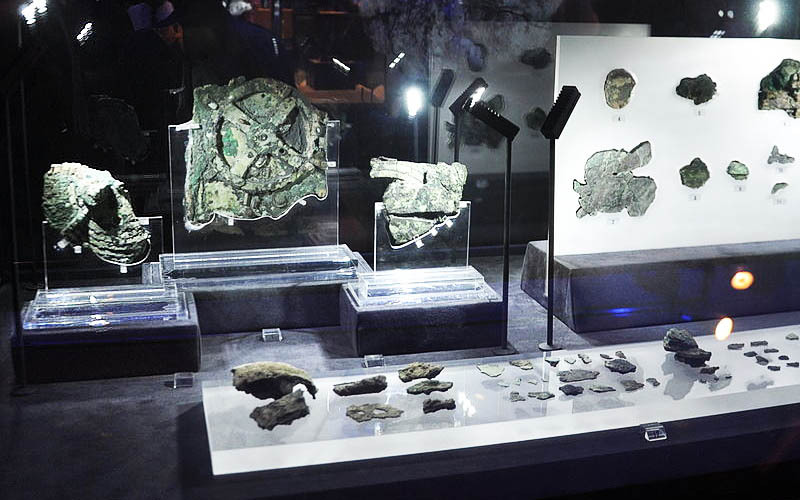 The Antikythera Mechanism currently on display in the Hellenic Museum in Athens, Greece. Located approximately 450 kilometres south of Cairo in Egypt is the very ancient city-complex of Abydos. Believed by many to be one of the most important historical sites relating to ancient Egypt it is also the location of a set of carvings that have caused significant controversy amongst archeologists and historians. 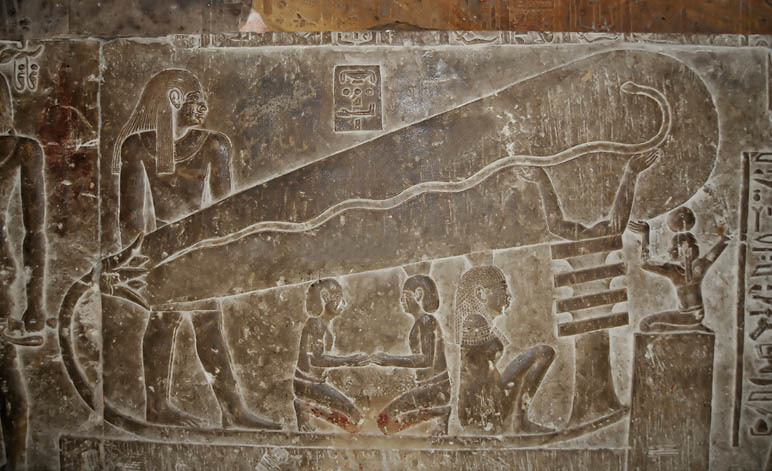 Within the Temple of Seti the 1st (Seti I) you can find the outer Hypostyle Hall and on one of the lintels you can find a series of carvings that look very much like helicopters and futuristic space craft. The Helicopter is particularly recognizable and this has led to questions being raised about how this can possibly exist. Naturally, every UFO enthusiast or believer in a once technologically advanced Atlantean civilization has pointed to these images as proof of their theories. Equally, every mainstream Egyptologist has gone to great lengths to explain that they are nothing more than the result of older hieroglyphs that were plastered over and then carved again so that when the plaster later collapsed the modified images that were under the plaster reappeared but in their new and coincidental design. This has been the official line debunking the Abydos Machines. Quite complex charts have been created to show how the process took place. Further more, they have rolled out the old argument that because they have never found items of this nature they could never have exited. Where are they now, they laugh? Did they just fly away? Oh whoops! 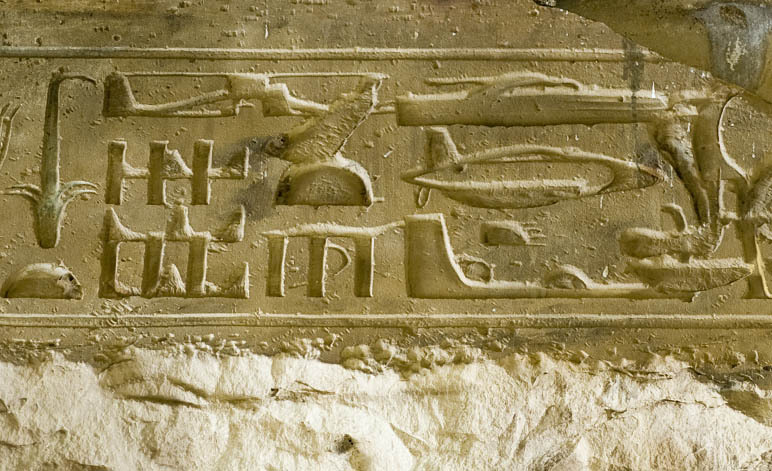 Image: The Abydos carvings (located in the Temple of Seti The First – Abydos, Egypt ) showing a helicopter and other futuristic vehicles. There are three stone reliefs (carvings) that can be viewed in the Hathor Temple section of the Dendera Archaeological complex which is located on the banks of the Nile approximately 300 miles south of Cairo, Egypt. Some researchers’ claim that these images depict an ancient form of electrical technology or lighting system. Mainstream Egyptologists strongly dispute that there is anything unusual about the carvings and claim that they merely represent aspects of Egyptian mythology and actual show the birthing of a snake from a lotus flower. However, a close look at the picture does raise some interesting points and questions. The lotus flower is easily recognisable but the beam (or bulb) is unusual. The stem of the lotus is unusually long and cable-like – and does appear to connect to a device that is similar to the ancient Baghdad Battery. (Also featured in this section.) The pillar does look remarkably like a modern electrical insulator of the type that is used on national power-lines and from this device two arms reach up to support the bulb or beam. The snake is a representation of power and energy and leaves the lotus in a manner very similar to the elongated filaments associated with industrial lighting. There have been many claims used to try and prove that these objects were real and these claims have subsequently been debunked. This criticism has then been associated with the carvings too. Those opposed to the electrical lighting theory have often argued that if these existed there would have been archaeological artefacts found to corroborate pictures. They claim that no such artefacts have been found. This is a fallacious argument. It depends on the idea that something can’t exist because humanity either hasn’t found it or can’t understand it. This is a subject worth exploring in much more detail. Image: Discovered in the Hathor Temple of the Dendera Archaeological complex in Egypt. Located in the recently restored church of San Pietro, Montalcino, Italy, are three beautiful works of art. The one located immediately behind the alter is called the Glorification of the Eucharist and was painted just before 1600 AD by the very talented artist Ventura Salimbeni. What makes this painting both rare and unusual is the focal point which features a mechanical device that strongly resembles a satellite or observation drone. Although this has been refuted as nothing more than a creation globe there are a few points worth noting that challenge this rather high-handed dismissal. The device clearly has telescopic antenna, what appears to be a camera (or lens) as well as a spotlight. According to some people the lens is a depiction of the moon and the light is a depiction of the sun. If this is the case then the moon is a double crescent and the Sun is depicted proportionally smaller than it should be. In addition, the antennas are clearly fixed to the globe with grommet-like devices and are tipped with aerial spheres. The globe also displays lines which have been claimed to represent early longitude lines on the globe of the Earth. (We should have better image soon.) This too cannot be true as in 1600 AD the prevalent belief was that the world was flat not round. It would have actually been illegal to depict it in this way. In fact, the lines look like the joins in metal plates and perhaps that is what they are. Located at Baalbek in Lebanon are the largest megalithic stones ever carved from the “living” rock of a quarry. Often referred to as Cyclopean, they range in size and mass but the most sizeable is estimated to weigh nearly 1,300 tons and lies unused. 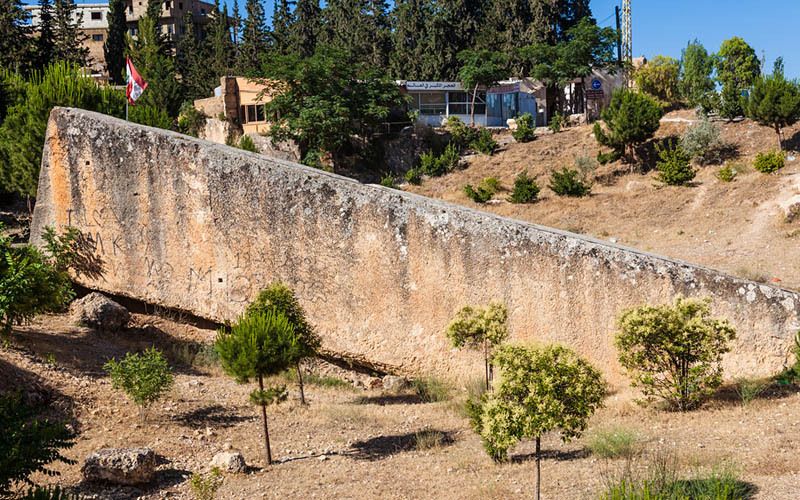 It seems that thousands of years ago they were shaped into gigantic rectangles and moved over a kilometer to be used in the early construction of the Baalbek Archeological Complex which was expanded during the Roman period when the town was known as Heliopolis (City of the Sun). They are not merely foundation stones as it is quite clear that they rest on a deeper layer of smaller, but still very large, blocks. These massive units each weighing approximately 750 tons were built into the western retaining wall of the plaza and are known as the Trilithon. The precision with which these megaliths have been carved is incredible and would be nearly impossible to achieve even today. How they were moved and placed within the construction of the greater Baal-Jupiter (Zeus) Temple plaza remains unexplained. Over the years various experiments have taken place that show that while it is possible for vast numbers of men with levers and rollers to move large building stones of up to 300 tons for short distances these megaliths are more than twice as large. The size of the largest megalith and the fact that moving it even with modern technology would be extremely difficult does suggest that the ancient civilizations may well have had more advanced technology than we currently believe. Still, what that technology was and how it worked will have to remain a mystery for now. One of the largest of the Baalbek Megaliths and known for some ancient reason as the Stone of the Pregnant woman – Baalbek, Lebanon. This unusual discovery was made in 1908 in an underground temple depository linked to the ancient Minoan palace site of Phaistos, on the island of Crete. Archeologist Luigi Pernier removed the disk from a layer of black earth which has allowed the artifact to be contextually dated to between 1850 BC and 1600 BC. 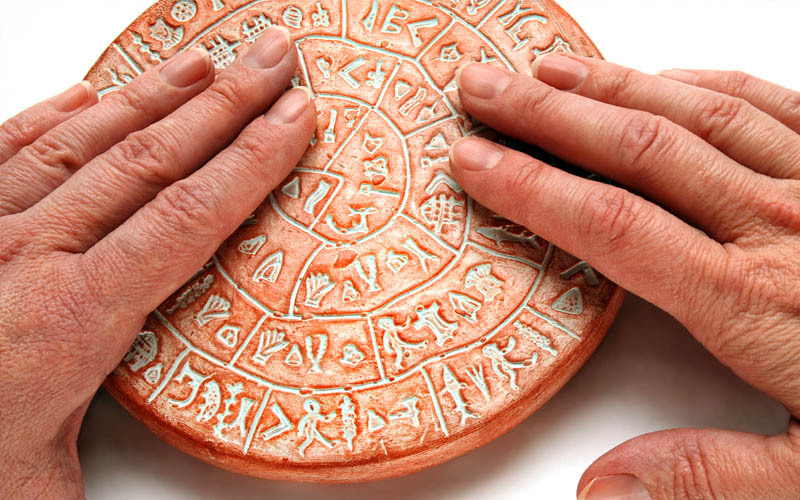 Made from fired clay, the disk is approximately 15cm in diameter and a centimeter thick with symbols imprinted on both sides. The meaning of the writing has never been understood in a way that is acceptable to mainstream archeologists or students of ancient languages. It is unusual for a number of reasons. Most importantly, it is one of a kind and no other item (with perhaps the exception of the Arkalochori Axe) bears any similar script. The writing itself has been created by pressing preformed characters into the soft clay which would make this the earliest recorded use of movable type. It is important to note that it was found close to a second tablet with standard writing from this period know as Linear A. Although there has been some controversy over the authenticity of the Disk it is widely believed to be genuine and is on display in the Heraklion Museum of Crete, Greece. Numerous theories have been suggested and range from the Phaistos Disk being a prayer token to a message from ancient aliens. A recent and quite plausible theory is that it was a coded message that was read and then disposed of by dropping it into the pits. If this is the case it would represent one of the earliest forms of sophisticated encryption. Image: The two sides of the ancient Phaistos Disk showing the undecipherable symbols – On display in the Heraklion Museum in Crete. These strange artefacts were originally discovered in 1936 during an archaeological dig at village of Khuyut Rabbou’a which is located approximately 20 miles south east of the city centre of modern Baghdad and close to the Arch of Ctesiphon. Described as 13 – 14cm in height they contained a copper cylinder and within this was suspended an iron rod. In December 1939, shortly after the start of World War II a German archaeologist by the name of Wilhelm Konig came across the item in the basement of the National Museum of Iraq. He immediately recognised their similarity to galvanic batteries and published a paper that suggested that these ancient electrical devices may have been used for electroplating precious gold onto silver. 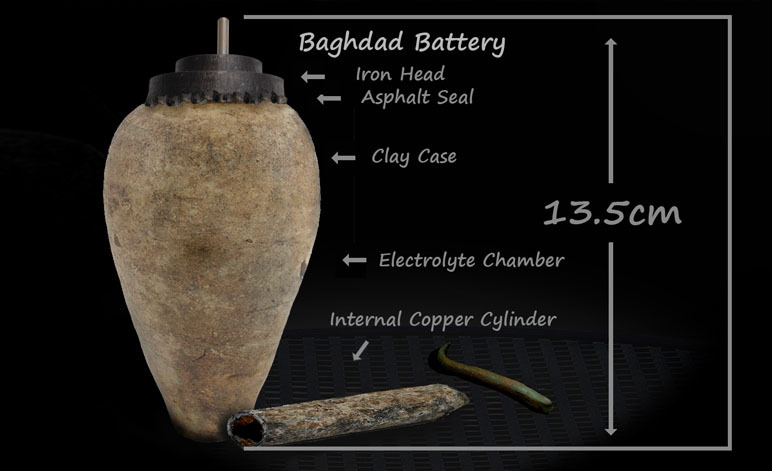 Reproduction of the Baghdad Battery that was discovered in 1936 in Iraq. Said to be in the possession of the Baghdad Museum but recent conflict and looting in the region may have altered this fact. During 1961 three rock collectors; Wallace Lane, Virginia Maxey and Mike Mikesell were hunting for geodes near the town of Olancha in the state of California when they discovered a potential specimen that would stimulate more than five decades of controversy. While cutting through the geode they discovered that instead of the normal cluster of crystals they expected to find they discovered a white ceramic cylinder that had a central iron core that was surrounded by an accretion of rust coloured stone. A faint hexagonal discolouring of the surrounding material could also be made out with the naked eye. According to Ms. Maxey the artifact was examined by an experienced geologist who stated that material surrounding the cylinder was at least 500,000 years old. 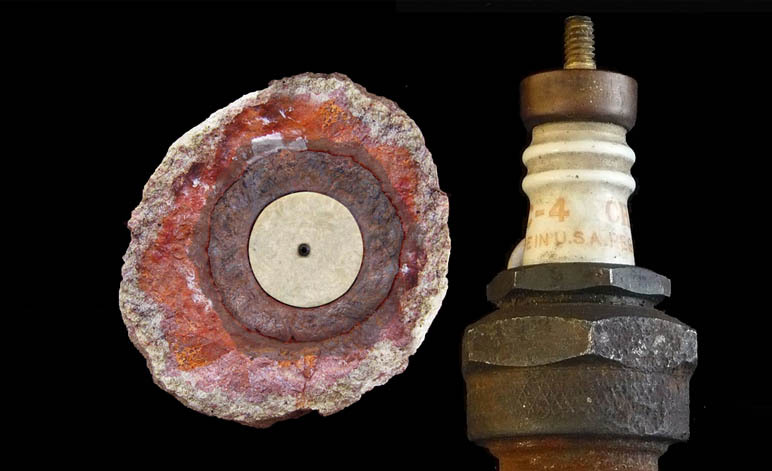 Image: 1920’s technology in the form of a spark plug encased in a 500,000 year old stone geode. This is the Coso Artifact – real mystery or mistaken analysis? This may be the most important section on this web page. It refers to a collection of historical records from ancient India that describe an array of incredible flying machines and weapons of a technological standard even more advanced than those in existence today. The oldest mention of these machines is found in the Sanskrit texts known as the Veda and date back to approximately 1,500BC. A modern translation reads: “jumping into space speedily with a craft using fire and water … containing twelve stamghas (pillars), one wheel, three machines, 300 pivots, and 60 instruments.” In the Ramayana texts there are references to flying machines that were used for the convenience of the ruling class. In the Mahabharata texts there are descriptions of battle planes that fire missiles that use sound to find their target and beams of light that destroy anything they touch with their energy. Credit for these machines was attributed to the Yavanas who are believed to be the ancient Greek civilisations. In or around the early 1950’s a more modern text was made available. Called the Vaimanika Sastra (science of Aeronautics) it was allegedly the “inspired’ work of Subbaraya Shastry who claimed it was based on the writings of the great sage Bharadwaja thus giving authenticity to the scientific claims. The picture is a concept drawing based on the written descriptions in the texts. However, it could equally well describe the Russian concept rocket depicted on the adjacent stamp. It is also worth noting that there are claims that the 1960’s Russian scientists took a deep interest in the Vimana phenomenon and strangely it is around this time that they made significant leaps forward in their technological achievements. Still, this is probably just a coincidence. Vimana are not unique to India and there are references from all over the world and include the Egyptian Saqqara Bird, the pre-Columbian golden airplane models, the Greek Icarus legend, the Chariot of Ezekiel, the Nazca runways (lines), The Abydos carvings, The Tassili rock paintings from Algeria and the Chinese references to Lu Ban’s wooden aircraft that flew great distances. Naturally, these references are often dismissed by modern historians as simply impossible but there can be no doubt that humanity has a collective memory of have once been able to fly in ancient times. Is this a coincidence based on the worldwide wishful thinking of past civilisations or is it a recollection of when it was actually possible. You must decide for yourself. Image: Soviet stamp depicting the USSR’s space exploration ambitions alongside an interpretation of a Vimana from ancient india. Fins, nose cone detachable sections? Fire has been used in war since the earliest records began and may thousands of years later modern man still depends on the same power taken to its extreme in the form of high explosives, cannons, missiles, guns and of course flame throwers. However, sometimes a weapon is developed that is so far ahead of its time and the military capabilities of the other forces that it changes the course of history. Greek Fire or Sea Fire as it is sometimes called was one such development and became the secret weapon of the Byzantine Empire. At its most basic it was a fluid chemical mixture that could be ignited and then sprayed onto enemy ships and personnel. Its effects were devastating because this fluid could not be extinguished with water. In fact, it was said to be able to burn under water and that any attempt to damp it down only made the flames burn more fiercely. It would cling to all materials and burn the flesh off the body of a man in seconds in a manner very similar to modern day phosphorus weapons. The formula was kept so secret that no one today knows how it was made nor have scientists been able to recreate it using the ingredients available at the time. Its invention has been attributed to the Syrian Engineer and architect Kallinikos around 675 – 673 AD who had fled from Baalbek (Heliopolis) in what is today Lebanon. 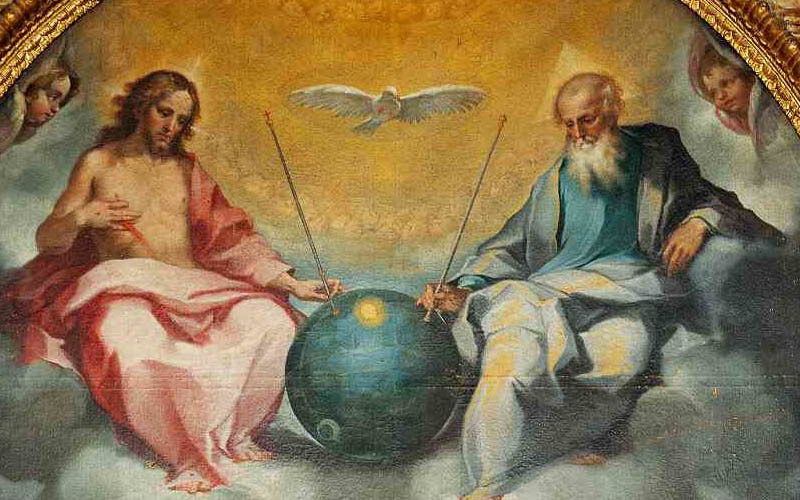 An alternative source of the knowledge is attributed to an Angel who revealed the recipe to Constantine personally on the agreement that it should remain a secret of Christianity forever. The one person who did attempt to reveal the secret of the fire was allegedly struck down by a bolt from heaven. Whatever the source the discovery and subsequent use of Greek Fire certainly saved Constantinople from the Muslim conquest and held back the rapid invasion of Europe. It was certainly discovered at a critical time that could not have been more opportune and it saved the Byzantine Empire. This coincidence deserves much more investigation. As to the recipe it is believed it contained an early form of refined petroleum, naphtha, sulphur, nitre, saltpeter and other ingredients that may have even included phosphorus. Resins are also mentioned as a possible component and recently there has been the suggestion that iron dust may have been included. Until more accurate records are discovered how it was made will remain a mystery and yet another lost technology of the ancients. 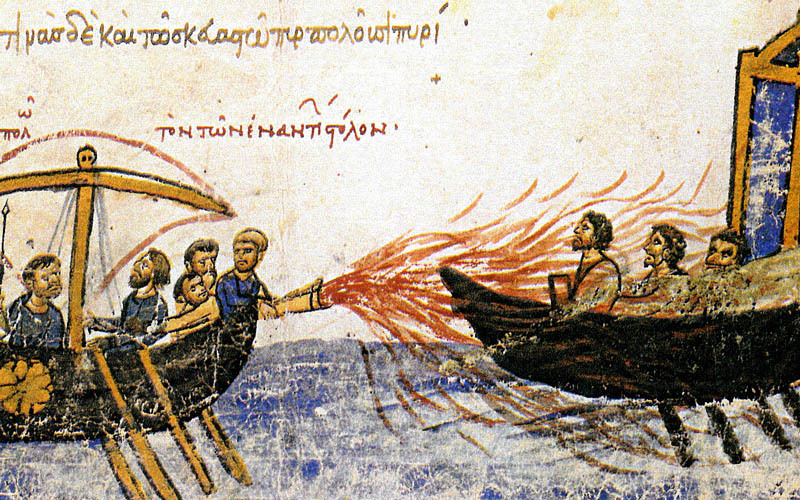 Image: A section from the illumination of the Skylitzes Manuscript in the National Library of Spain, Madrid, demonstrating the use of Greek Fire.